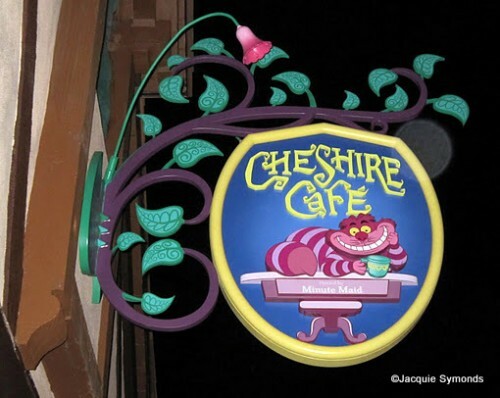 Once known as Enchanted Grove, the Cheshire Cafe in the Magic Kingdom’s Fantasyland was rethemed and renamed in fall 2011 to better match the teacups right next door. The whimsical location’s menu remains much the same, with cereal, muffins and fruit available, along with yummy slushes, strawberry punch, and other refreshing beverages. Breakfast items: Assorted cereals with milk, muffins, whole fruit. Drinks: Lemonade, orange juice, iced coffee, hot coffee, hot cocoa, hot tea, Smartwater, and Dasani. Special treats: Lemonade Slush, Raspberry Lemonade Slush and Strawberry Punch. 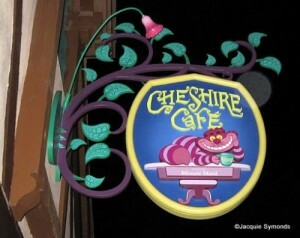 Disney Food Blog Review: White Chocolate Rabbit and Queen of Hearts Gourmet Cake Cups at Cheshire Cafe! Located directly across from the Mad Tea Party on the eastern side of Fantasyland, this is a great place to grab a treat before waiting to twirl around in the teacups. Or, on second thought, maybe you should wait until after….